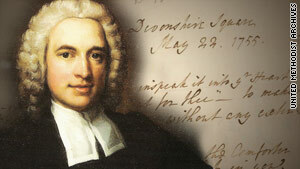 Among the missing items was a letter written by United Methodist Church founder Charles Wesley. Editor's note: Swetha Iyengar is a former Drew University student, and was a student employee at the United Methodist Archives. (CNN/In Session) -- An alleged theft of more than two dozen historical documents has shaken a New Jersey university where students are granted access to the artifacts. FBI agents arrested William Scott, 18, on March 14, and accused him of stealing more than 27 documents from the United Methodist Archives. Among them: letters from President Abraham Lincoln, President Franklin Roosevelt and Madame Chaing Kai-Shek. The archive, on the campus of Drew University in Madison, is the official repository for all artifacts and documents pertaining to the Methodist faith, notably the letters of John and Charles Wesley, the founders of Methodism. The Archives Center, as it is known on campus, has been hiring university students to help restore and categorize hundreds and thousands of rare letters, journals, and scholarly papers for 25 years. Scott, a freshman, was one of those students. According to a five-page complaint filed by the U.S. Attorney's office in Newark, New Jersey, the university was first alerted that the documents were missing when a rare document and autograph dealer called from England. The dealer, referred to as "J.W." in the complaint, became concerned when two documents he intended to purchase arrived damaged. The Archives Center immediately conducted an audit and noticed several John Wesley letters were missing. Among the missing items was a letter from John Wesley to Father Merriweather. It was estimated to be worth more than $5,000, according to court documents. According to the FBI, a March 13 search of Scott's dorm room turned up several papers belonging to the University, including some written by heads of state. This is the first time something like this has happened. "We have had students employed at the Archives Center for over 20 years, and this is the first time something like this has happened," said David Muha, the Chief Communications Officer for Drew University. In addition to the ongoing federal investigation, the university also is investigating, Muha said. All the documents at the Archives Center are stored in a temperature- and light-controlled vault underneath the building. Access to the vault is limited, but student employees are given keys so they can retrieve papers from the series they have been assigned to archive. Whether that policy changes is a matter under review, Muha said. "President [Robert] Weisbuch has asked the Dean of Libraries to look into the security at the Archives Center," Muha said. He has asked for a report by April 10. A theft of this nature is not to be taken lightly, said Nathan Raab, a historical document dealer and vice president of the Raab Historical Document Collection. "This is a serious crime. It's almost like stealing a car in terms of financial value, and in some cases it's worth even more, so really it's like stealing a Lexus." Raab also stressed that in the small world of buying and selling historical documents, dealers are very careful about doing the research and checking out the sources they buy from. It's a small world of autographs and manuscripts. "There is a lot of due diligence that goes along with this," said David Lowenherz, founder and owner of Lion Heart Autographs, "it's a small world of autographs and manuscripts, so the minute something like this happens, the rest of us in the community hear about it. Echoing this sentiment Raab cautions, "People who think they can steal a letter from Lincoln and then try to sell to the few reputable dealers out there and not get caught are in for a rude surprise." Former Drew students who worked at the Archives Center were stunned by the theft charges. "The whole thing seems pretty horrible," said Andrew Prolow. "I mean it is hard to say what is going to happen next. They are going to have to change some policy from a security perspective. And it will damage some of the privileges students have had in the past." Another former student employee, Jamie Cahiwat, also was concerned. "It makes me angry to know that some of the papers could be damaged, most likely permanently," Cahiwat said. "And it makes me sad that the people who work at the archives are so trusting and this person took advantage of that trust, and took advantage of not just school or Methodist history, but American history." Scott was released on $50,000 bail and is in the custody of his parents in Massachusetts. CNN left two messages on his attorney's voicemail, and has not heard back. His travel has been limited, and the U.S. Attorney's office has 30 days to file an indictment or seek a continuance. Should Scott be convicted, he faces up to 10 years in prison. The university has declined to speak about whether Scott is still enrolled at the school, but university policy states that "disciplinary actions undertaken by Drew University will normally proceed during the pendency of any criminal proceedings, and ... disciplinary actions shall not be subject to challenge on the ground that a criminal allegation involving the same incident is pending, has been dismissed, or has been reduced." "It is a sad day when a student at one of our nation's learning institutions pilfers great cultural and historical resources, rather than respects and learns from them," said U.S. Attorney Paul J. Fishman in a news release.